9/8/18 @ Columbus North (indoor), 45.1, 1st place, Best Music, Best General Effect, Best Percussion, Best Auxiliary; 9/15/18 @ Brownsburg, 56.18, 1st place, Best Music, Best Visual, Best General Effect, Best Auxiliary; 9/22/18 @ Avon, 61.4, 2nd place, Best Auxiliary; 9/29/18 @ Springs Valley, 63.3, 3rd place; 10/5/18 @ ISSMA Invitational (Whiteland), Gold rating, "With Distinction" in Visual; 10/12/18 @ ISSMA Regional (Evansville Central), Gold rating; 10/19/18 @ Whiteland, 70.1, 4th place; 10/26/18 @ ISSMA Semi-State, State Finalist; 11/3/18 @ ISSMA State Finals, 6th place; 11/9-11/10/18 @ Bands of America Grand Nationals @ Lucas Oil Stadium, Semi-Finalist, 4th in class; 2018 SUDLER SHIELD Nominee. 9/9/17 @ Columbus North, 59.5, 1st place, Best Music, Best Visual, Best General Effect, Best Auxiliary; 9/16/17 @ Brownsburg, 54.00, 2nd place, Best General Effect; 9/23/17 @ Avon, 55.95, 2nd place, 9/30/17 @ Springs Valley, 63.7, 3rd place; 10/7/17 @ ISSMA Invitational, Gold rating, "With Distinction" in Visual and Effect; 10/14/17 @ ISSMA Regional (Lafayette Jefferson), Silver rating; 10/21/17 @ Whiteland, 58.65, 1st place, Best Music, Best Visual, Best General Effect, People's Choice Award; 10/28/17 @ ISSMA Semi-State, State Finalist; 11/4/17 @ ISSMA State Finals, 8th place; 11/9-11/11, Bands of America Grand Nationals@Lucas Oil Stadium, 15th in Class A, 62.95, Division II; Jazz Ensemble, Gold rating "With Distinction"; Concert Band, Gold rating "With Distinction," Gold Sight-Reading. 9/10/16 @ Columbus North, 52.5, 1st place, Best Music, Best Visual, Best General Effect, Best Percussion, Best Auxiliary; 9/11/16 @ Festival Parade, Grand Marshall's Trophy; 9/17/16 @ Brownsburg, 51.55, 3rd place; 9/24/16 @ Avon, 45.1, 3rd place, Fan's Choice Award; and Hamilton SE, 59.4, 1st place, Best Music, Best Visual, Best General Effect, Best Percussion, Best Auxiliary; 10/1/16 @ Decatur Central, 48.75, 1st place, Best Music, Best Visual, Best General Effect; 10/8/16 @ ISSMA Invitational, Gold rating; 10/15/16 @ ISSMA Regional @ (Evansville Central), Gold Rating, "With Distinction" in Music; 10/22/16 @ ISSMA Semi-State, State Finalist; 10/29/16 @ ISSMA State Finals, 7th place; 11/5/16 @ MSBA Class AA Championships, Miamisburg, T5th in prelims, 4th in finals, 81.9; 11/11/16 @ BOA Grand Nationals @ Lucas Oil Stadium, 13th in Class A, 60.90, Division II. Jazz Ensemble, Gold rating. Concert Band, Gold rating "With Distinction". 9/12/15 @ Columbus North, 63.0, 1st place, Best Music, Best Visual, Best Effect, Best Percussion, Best Auxiliary; 9/19/15 @ Brownsburg, 57.9, 1st place, Best Music, Best Visual, Best Effect, Best Percussion, Best Auxiliary; 9/26/15 @ Avon, 56.9, 1st place, Best Music, Best Visual, Best Effect; and Hamilton SE, 67.6, 1st place, Best Music, Best Visual, Best Effect, Best Auxiliary; 10/3/15 @ Decatur Central, 59.85, 1st place, Best Music, Best Visual, Best Effect, Best Percussion, Best Auxiliary; 10/10/15 @ ISSMA Invitational, Gold rating, "With Distinction" in Music, Visual, Effect; 10/17/15 @ ISSMA Regional (Lafayette Jefferson), Gold rating, "With Distinction" in Visual; 10/23/15 @ BOA Super Regional, 64.45; 10/31/15 @ ISSMA Semi-State, State Finalist,; 11/7/15 @ ISSMA State Finals, 7th place; 11/12-11/14/15 @ BOA Grand Nationals, 5th in Class A, 72.40, Division II. Jazz Ensemble, Gold rating. Concert Band, Gold rating. 9/6/14 @ Columbus North, 54.3, 1st place, Best Music, Best Visual, Best Effect, Best Auxiliary; 9/13/14 @ Brownsburg, 61.3, 1st place, Best Music, Best Visual, Best Effect, Best Percussion, Best Auxiliary; 9/20/14 @ Hamilton SE, 62.7, 1st place, Best Music, Best Visual, Best Effect, Best Percussion; 9/27/14 @ Avon, 56.6, 1st place, Best Music, Best Visual, Best Effect; 10/4/14 @ Danville, 60.15, 1st place, Best Music, Best Effect; 10/11/14 @ ISSMA Invitational, Gold rating, "With Distinction" in Music, Visual, Effect; 10/18/14 @ Regional (Evansville), Gold rating, Semi-State Finalist; 10/25/14 @ BOA Indy Super Regional, 59.65; 11/1/14 @ Semi-State, State Finalist; 11/8/14 @ ISSMA State Finals, 8th place; 11/13/14 @ BOA Grand Nationals, Division II. Jazz Ensemble, Gold rating. Concert Band, Gold rating. 9/7/13 @ Columbus North, 67.1, 1st place, Best Music, Best Visual, Best Effect, Best Auxiliary; 9/14/13 @ Brownsburg, 70.0, 1st place, Best Music, Best Visual, Best Effect, Best Auxiliary, Best Percussion; 9/21/13 @ Hamilton SE, 70.5, 1st place, Best Music, Best Effect; 9/28/13 @ Avon, 56.1, 1st place, Best Music, Best Effect; 10/5/13 @ Danville, 69.5, 1st place, Best Music, Best Visual, Best Auxiliary; 10/12/13 @ ISSMA Invitational, Gold rating, "With Distinction" in Music, Effect; 10/19/13 @ ISSMA Regional, Gold rating, "With Distinction" in Music, Visual, Semi-State Finalist; 10/26/13 @ ISSMA Semi-State, State Finalist; 11/2/13 @ ISSMA State Finals, 5th place, @ Mid-States Championships, 3rd in Prelim, 3rd in Finals; 11/8/13 @ BOA Indy Super Regional, Division II; 11/15/13 @ BOA Grand Nationals, Division II. Jazz Ensemble, Gold rating. Concert Band, Gold rating. 9/8/12 @ Columbus North, 59.7, 1st place, Best Music, Best Visual, Best Effect; 9/15/12 @ Martinsville, 64.4, 1st place, Best Music, Best Visual, Best Effect, Best Percussion, Best Auxiliary; 9/22/12 @ Hamilton SE, 68.6, 2nd place, Best Auxiliary; 9/29/12 @ ISSMA District, Gold rating, Regional Finalist; 10/6/12 @ Ben Davis, 56.1, 4th place; 10/13/12 @ ISSMA Regional (Evansville), Gold rating, Semi-State Finalist; 10/20/12 @ Danville, 67.7, 1st place, Best Music, Best Visual, Best Effect, Best Auxiliary; 10/27/12 @ ISSMA Semi-State, Gold rating, State Finalist; 11/3/12 @ ISSMA State Finals, 5th place; 11/9/12 @ BOA Grand Nationals, 6th in class. Jazz Ensemble, Gold rating. Concert Band, Gold rating. 9/10/11 @ Columbus North, 62.1, 1st place, Best Music, Best Visual, Best Effect, Best Percussion, Best Auxiliary; 9/17/11 @ East Central, 71.7 in AAA prelims, 1st place, Best Music, Best Visual, Best Effect, Best Percussion, Best Auxiliary, 72.3 in Finals, 3rd place; 9/24/11 @ Hamilton SE, 69.5, 1st place, Best Music, Best Visual, Best Effect, Best Auxiliary; 10/1/11 @ ISSMA District, Gold rating, Best Music, Best Visual, Best Effect, Regional Finalist; 10/8/11 @ Center Grove, 67.9, 2nd place; 10/15/11 @ ISSMA Regional, Gold rating, Semi-State Finalist; 10/22/11 @ ISSMA Semi-State, State Finalist; 10/29/11 @ ISSMA State Finals, 9th place; 11/5/11 @ Mid-States Championships, 1st in Prelims, 2nd in Finals; 11/11/11 @ BOA Grand Nationals, Semi-Finalist, 3rd in class. Jazz Ensemble, Gold rating. Concert Band, Gold rating. @ Columbus North, 52.4, 1st place, Best Music, Best Visual, Best Effect; @ East Central, 54.8, Class A, 1st place, Best Music, Best Visual, Best Effect, Best Percussion, Best Auxiliary, 4th place in Finals; @ Hamilton SE, 58.9, 1st place, Best Music, Best Visual, Best Effect, Best Percussion, Best Auxiliary; @ ISSMA District, Gold Rating, Best Music, Best Visual; @ Center Grove, 2nd place; @ ISSMA Regional, Gold rating, Semi-State Finalist; @ ISSMA Semi-State, participant; @ Centerville, 76.1, 1st place, Best Music, Best Effect; @ Mid-States Championships, 75.4, 1st in Prelims, 81.7, 1st in Finals, Best Music, Best Effect; @ BOA Grand Nationals, Division II. Jazz Ensemble, Gold rating. Concert Band, Gold rating. @Columbus North, 1st place, Best Music, Best Visual, Best Effect, Best Auxiliary; @ East Central, Class A, 1st place, Best Music, Best Visual, Best Effect, Best Percussion, Best Auxiliary, 4th place in Finals; @ Hamilton SE, 1st place, Best Music, Best Visual, Best Effect, Best Percussion, Best Auxiliary; @ District (Columbus East), Gold rating, Best Music, Best Visual, Best Effect; @ Ben Davis, 1st place, Best Music, Best Visual, Best Effect, Best Auxiliary; @ ISSMA Regional (Evansville Central), Gold rating, Semi-State Finalist; @ ISSMA Semi-State, Gold rating, State Finalist; @ ISSMA State Finals, 4th place; @ Mid-States Championships, Class A, 1st in Finals; @ BOA Grand Nationals, Division II. Jazz Ensemble, Gold rating. Concert Band, Gold rating. @Columbus North, 3rd place; @ Kokomo, 2nd place; @ Hamilton SE, 8th place; @ ISSMA District (Columbus East), Gold rating, Best Music, Best Visual, Best Effect, Regional Finalist; @ Greenwood, 6th place; @ Martinsville, 3rd place; @ ISSMA Regional (Evansville Central), Gold rating, Semi-State Finalist; @ Center Grove, 3rd place; @ ISSMA Semi-State, participant; @ Mid-States Championships, 5th in Finals; @ BOA Grand Nationals, Division II. Jazz Ensemble, Gold rating. Concert Band, Silver rating. @ Lafayette Jefferson, 6th place, Best Drum Major; @ Kokomo, 1st place, Best Music, Best Effect; @ Hamilson SE, 2nd place, Best Visual, Best Auxiliary; @ Martinsville, 1st place, Best Music, Best Visual, Best Auxiliary; @ ISSMA District (Columbus East), Gold Rating, Best Music, Best Visual, Best Effect, Regional Finalist; @Madison, 1st place, Best Music, Best Visual, Best Effect, Best Percussion; @ ISSMA Regional, Gold rating; @ Mid-States Championships, 2nd place in Prelims, Best Visual, 2nd in Finals; @ BOA Grand Nationals, Semi-Finalist. Jazz Ensemble, Gold rating. Concert Band, Gold rating. @Franklin, 3rd place; @ Warren Central, 2nd place; @ Martinsville, 1st place, Best Music, Best Visual, Best Effect, Best Percussion; @ ISU, 3rd place; @ Brownsburg, 3rd place; @ ISSMA District (Southport), Gold Rating, Best Visual, Regional Finalist; @ Terre Haute North, 1st place, Best Visual, Best Effect, Best Auxiliary; @ ISSMA Regional (Jeffersonville), Silver rating; @ Center Grove, 3rd place, Best Visual; @ Mid-States Championships, 2nd in Prelims, 1st in Finals, Best Music, Best Effect. Jazz Ensemble, Gold rating. Concert Band, Gold rating. @ Columbus North, 2nd place; @ New Palestine, 5th place; @ ISU, participation; @ Brownsburg, 4th place; @ ISSMA District (Southport), Gold rating, Regional Finalist; @ Center Grove, 3rd place; @ ISSMA Regional, Silver rating; @ LaSalle (OH), 3rd place; @ Mid-States Championships, 25th place. Jazz Ensemble, Gold rating. Concert Band, Silver rating. @ Columbus North, 3rd place; @ Plainfield, 3rd place; @ Brownsburg, 4th place; @ ISSMA District, Gold rating, Regional Finalist; @ ISU, 3rd place; @ ISSMA Regional, Bronze rating. Jazz Ensemble, Gold rating. Concert Band, Silver rating. @ Triton Central, 2nd place; @ Columbus North, 2nd place, Best Visual; @ ISU, 6th place; @ ISSMA District (Southport), Division 1 rating, Regional Finalist; @ Greenwood, 4th place; @ ISSMA Regional, Division 2 rating; @ Center Grove, 5th place, People's Choice. Jazz Ensemble, Division 1 rating. Concert Band, Division 1 rating. @ Columbus North, 3rd place, Best Effect; @ ISU, 8th place; @ ISSMA District (Southport), Division 1 rating, Regional Finalist; @ Avon, 3rd place; @ ISSMA Regional, Division 2 rating. Jazz Ensemble, Gold rating. Concert Band, Silver rating. @ Columbus North, 5th place; @ Triton Central, 3rd place; @ ISU, 12th place; @ ISSMA District (Southport), Division 1 rating, Regional Finalist; @ Avon, 5th place; @ ISSMA Regional, Division 2 rating; @ Center Grove, participation. Jazz Ensemble, Gold rating. Concert Band, Gold rating. 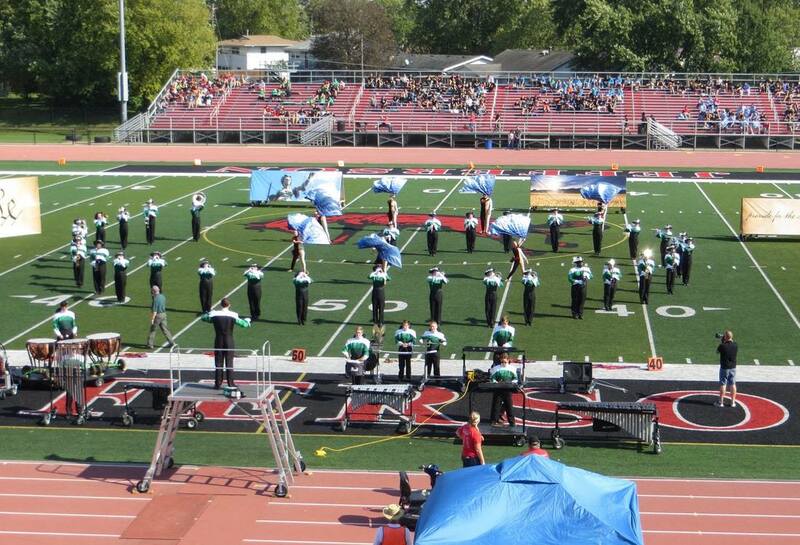 @ Triton Central, 4th place, @ Ben Davis, 4th place, @ ISSMA District (Southport), Division 3 rating. Jazz Ensemble, Silver rating. Concert Band, Silver rating.